TEF – what is it, where did it come from and how it might develop? Posted in Teaching & Learning | Tagged Issues for the profession, TEF | Comments Off on TEF – what is it, where did it come from and how it might develop? Read a report from the 46th Annual UACES Conference which took place at Queen Mary University of London, 5-7 September 2016. How can Twitter be integrated into teaching and learning European Studies? What are the pitfalls and challenges faced when using this medium? 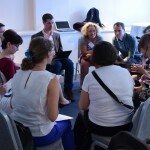 Here, Egle Dagilyte, shares advice and tips from UACES social media academic enthusiasts.